The HP Deskjet 1510 is a basic home printer with scanning and copying features. The device offers high-quality and high-speed printing. The printer offers fast data transfer through USB connectivity. 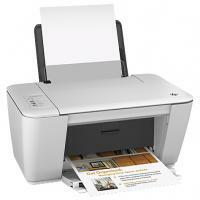 HP Deskjet 1510 is a compact printer with an attractive sleek design. It has membrane switches as a neat control panel on top and a flatbed scanner. The printer has two paper tray; one at rear for A4 sheets input and the output tray folds down at front with an extension to hold the paper. The printer accepts, both, XL and regular HP Deskjet 1510 ink cartridge. The XL cartridges help the users to reduce their running costs. However, the tri-colour cartridge systems seems a waste of colour. The HP Deskjet 1510 is a good all-in-one printer for home users. The device offers high-quality prints at a decent speed. However, if you are looking for a high-tech printer with advanced features this one might not attract you. The device does not have a wireless connectivity which many of the low-cost all-in-one printers offers. You can also opt for HP DESKJET 1510 ink multipack to save more. Is your HP Deskjet 1510 printer delivering blurred or low-quality outputs? If your printer is producing low-quality prints it might be the result of the low volume of or dry out HP Deskjet 1510 ink cartridges. Try replacing the ink cartridges and check the prints again. Excess printing work can also affect the print quality. So if you have been using the printer continuously from a while, give it a rest. Turn the printer off and let it rest for 30 minutes. If the prints still does not improve, continue with following steps. The quality of the papers can also cause poor quality prints. Even, printing on the non-printable side of the paper also affects the printout quality. If you are using one side printable paper sheet make sure to put the smooth (printable side) down on the input tray. In other cases, old and dusty papers also make the print look blurry. If the sheets were stored in the paper tray for a long while, replace them with a new pile. In case of photo blanks don’t use leave the papers out for more than 30 minutes. Another issue in prints can arrive due to wrinkled or curled papers. If the printouts are having lines or bands, check the sheets and make sure they are all clean and smooth. Check the printer’s setting on your PC if the issue continues. Go to your printer setting and check if all the settings are configured according to your printing needs. Check the ink levels of all the colour cartridges using the HP software. In case of low ink levels replace these HP DESKJET 1510 ink cartridges and continue with your printing job. Q. How do I make the payment when buying HP Deskjet 1510 ink cartridges? Are all my details secured? A.You can pay by Laser Card, American Express, MasterCard or Visa credit card, Maestro, Switch, Solo or Delta debit card. When you choose to purchase an item on this website the payment will be hosted by Sage Payments which makes sure that your credit/debit card details are safe and secured. You can also choose to pay by PayPal which ensures security as well. Q. How do I clean my HP Deskjet 1510 ink cartridge contacts so that the ink cartridges function properly? Turn on the printer and open the ink cartridge door. The electrical contacts are located on the bottom of the ink cartridge. They are the small gold-coloured dots on your cartridge. Gently wipe the contacts using a clean dry cloth. Locate the contacts for the cartridge inside the ink cartridge holder and gently clean them as well. Reinstall the ink cartridges and close the cartridge door. Q. Are the compatible HP Deskjet 1510 ink cartridges environment friendly? A. Yes, using any of our compatible ink cartridges will help to preserve the Earth. These compatible cartridges are filled with ISO standard inks and offer you the benefit of eco-friendliness without compromising the print quality. Q. What is the shelf life of HP Deskjet 1510 ink cartridges? A. HP Deskjet 1510 ink cartridges can last up to 18 months in its packaging, without drying up. Q. How much space do HP Deskjet 1510 printers take up? A. HP Deskjet 1510 printers measure about 16.7 inches in width, 12 inches in depth and 6.2 inches in height. The printer weighs only about 4 kg. Q. How many pages can remanufactured HP DESKJET 1510 ink cartridges print without the need to be replaced? A. Our remanufactured HP DESKJET 1510 ink cartridges can print 90% more pages than original ink cartridges. The remanufactured HP301XL black ink cartridge can print up to 480 pages and remanufactured HP301XL colour ink cartridge can print up to 330 pages without replacement. Q. How much power does an HP DESKJET 1510 printer consume? A. This printer consumes 10 Watts of energy while operating and 1.6 Watts of energy during standby. You can significantly reduce power consumption by using this printer in ENERGY STAR mode. Q. Do you provide paper that can be used with my HP DESKJET 1510 printer? A. Yes, we provide envelopes, A4 size white paper, glossy paper and glossy photopaper that you can use with your DESKJET 1510 to print on. Q. Can using remanufactured HP DESKJET 1510 ink cartridges instead of new ones cause problems to my printer? A. No, we assure you that using our remanufactured HP DESKJET 1510 ink cartridges will not cause any damage to your printer. All our products are FSC tested and certified and are warranted to be free from any defects. Q. What operating systems are compatible with this printer? A. You can use this printer with Windows XP, Windows Vista, Windows 7, Windows 8, Windows 10 and Mac OS v10.6 or later. Q. How long would it take for HP DESKJET 1510 ink cartridges to be delivered to me in Dublin? A. Usually, if you place an order on our website before 12 noon, the item will be delivered to you within 1 - 2 days. However, if your order is urgent and you require your product faster than the standard delivery time, you can call us on 048 308332211 and we will try to deliver the product to you as fast as possible. Q. Do manufacturers offer a full refund if a customer wants to return the HP DESKJET 1510 ink cartridges? A. Yes, there are manufacturers who offer a full refund for up to 12 months for these ink cartridges in case a customer faces quality issues and desires to return them. Q. Can I expect top-notch quality from compatible HP DESKJET 1510 ink cartridges, considering they are promoted as a cost-effective product? A. Yes. You can look forward to maximised satisfaction in terms of quality as well as quantity if you choose these ink cartridges. Compatible ink cartridges match their original counterparts in every respect. Q. Can I print more than 300 pages in black with the compatible HP DESKJET 1510 ink cartridges (HP301xl)? A. You can actually print up to 480 pages in black with these compatible HP ink cartridges. Q. I heard that HP has updated its firmware that rejects third party cartridges. Will it have any impact on using compatible ink cartridges and can I can I continue using them if I don't install the firmware update? A. Yes, HP updates its firmware regularly with an aim to prevent its cartridges from being used in other printers in case they are stolen. The update would have an impact if you install the firmware update knowingly or unknowingly. You need to be careful and ensure you don’t tick the box that appears on your screen when the update is on. It will help you continue using compatible cartridges even after the update. Q. Sometimes when my printer (HP DESKJET 1510) doesn’t work when I install new compatible HP DESKJET 1510 ink cartridges, I remove the cartridges, check and insert them in the printer again. Is this step appropriate and safe or will it harm the printer? Please advise. A. It is very much acceptable to perform this procedure if it’s done with care. Q. I live in Belfast. Can I order two packs of black cartridges for my HP Deskjet 1510? A. Yes, you can indeed place an order but we cannot process an order from this section of the site. If you have difficulty placing the order online you can get help or order over the phone by calling 028 3083 3221 from NI or 048 3083 3221 from ROI. Q. Can I connect wirelessly to the HP Deskjet 1510? A. Unfortunately, there is not a wireless feature on this printer and it uses USB connection to connect to your laptop or desktop device. Q. Would this printer be suitable for a busy office? A.Unfortunately due to the size and capability of this printer, it may not be suitable for the likes of a busy office space, however, it'd be more suited to a small home based office. A.This printer does not have features such as Apple AirPrint or wireless connection. This, therefore makes it less modern than some HP models out there. Q. How checking the ink supply level give beneficial results? A.The HP DESKJET 1510 ink cartridges are available in small sizes. Thus the ink cartridge gets expire very fast and needs replacement. You can easily check the ink supply level to determine how soon you might need to replace an ink cartridge. The ink supply level shows an estimate of the amount of ink remaining in the ink cartridges. In such case of low ink levels replace these HP DESKJET 1510 ink cartridges and continue with your printing job. Q. Does the printer supports tri-colour ink cartridges? A.Yes, both black and tri-colour HP DESKJET 1510 ink cartridges are supported by the printer. The black ink cartridge offers you 190-page prints and the tri-colour cartridge offers 165 pages in one lifetime. The Deskjet printer not only delivers you high-quality print-outs but also can scan and photocopy with high resolution. Q. How defective cartridge can be identified? A.If one start getting poor, blurred, smeared, or faded printouts then this could be the result of dust on the cartridge contacts due to paper being stuck there for long time. This can cause poor connection with the printer and result in Defective Cartridge error. Also, if both the tri-colour and black ink cartridge lights are blinking, found low on ink, or are missing then make sure that the cartridges were installed properly. You need to take out the cartridges and check if the pink tapes (the seal tapes) from both the cartridges have been removed. Then install these HP DESKJET 1510 ink cartridges back into their specific slots and ensure that they are locked properly with a ‘click’ sound. If both ink cartridge lights are still blinking, then one or both cartridges may be defective. Q. How to improve the print quality of HP Deskjet printer? A.To improve the print quality make sure you are using good-quality HP DESKJET 1510 ink cartridges . To print successfully, check the printer software to make sure you have selected the appropriate paper type and print quality from the Media drop-down list. Do check that the estimated ink levels of the printer do not run low on ink and if found so replace the cartridges to improve the quality. Q. Which cartridges work with my HP Printer? A.To determine which ink or toner cartridges work with your HP printer, locate the correct cartridge number which is located inside the cartridge access door. The HP ink and toner cartridges are labeled with alphanumeric characters and colour descriptions that help distinguish which cartridges work with selected printers. HP always recommends the use high-quality cartridges. Only by using good-quality HP DESKJET 1510 ink cartridges that are designed and tested will help you to easily get great results. Q. How many pages can be print from HP DESKJET 1510 printer? A.The device offers high-quality prints at a decent speed. However, if you are looking for a high-tech printer with advanced features this one might not attract you. This printer is very user-friendly and has up to 7 pages per minute speed for black and up to 4 pages per minute for colour prints which satisfy the needs of small office. The Printer has print pace at up to 7 ppm for black & white and up to 4 ppm for colour docs. Moreover, it features up to 1200x1200 dpi scan-resolution to produce great scanning results. With the 60-sheets input and 25-sheets output trays, one can easily manage to print jobs smoothly. The HP 1510 Thermal Colour Printer has duty cycle of up to 1,000 pages per month so that you go on with your work at ease.